I have been using Ubuntu 10.10 Maverick Meerkat Desktop Edition for a few weeks, and it has satisfy most of my basic needs for a computer like web browsing, watching videos, listening to music, checking e-mail, word processing, and more. Ubuntu 10.10 is fast, stable, and easy to use after using for a few weeks as my main operating system of choice. Ubuntu has always been a very great Linux based operating system I used for a few years now since using Ubuntu 8.04 to the latest version which is 10.10. Installing, and updating Ubuntu 10.10 was very simple. All I had to do is start my computer from the Ubuntu Install CD, and pick Install. After the install, Ubuntu asks me if I want to update it. If you still need Windows, you can tell Ubuntu 10.10 to keep Windows while Installing Ubuntu 10.10 on your home computer. I really enjoy the fast start up time of Ubuntu 10.10 Linux since I only have to wait less then a minute in most cases to start up my computer. The fast shut down time for Ubuntu 10.10 is also great because I only need to wait a few seconds for my computer to fully shut down. My computer is not even using the most fast and advance computer parts. My computer has a 1.86 GHz Intel Core2Dou CPU, and 1 GB of DDR2 Ram which makes it not as fast as modern computers which have more faster parts. Ubuntu 10.10 has been very stable when I use it. I hardly experience any crashes since using it for a few weeks. Multi-tasking on Ubuntu 10.10 has been pretty fast. I usually have a web browser, Word Processor, and Music player open, and I do not experience noticeable slowness caused by too many programs being open at the same time. The Ubuntu Software Center also is great. I found a lot of great software like VLC media player, Gimp Image Editor, Google Chrome Web Browser, Audacity audio recorder, Adobe Flash Player, Java runtime, FileZilla FTP client, Kompozer web builder, and more to install on my computer running Ubuntu 10.10. 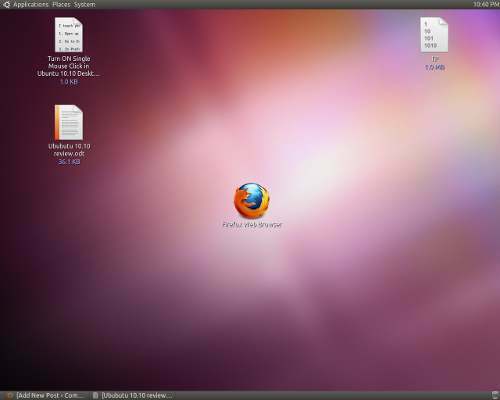 Using the Ubuntu Software Center to Install and remove programs from Ubuntu 10.10 is point and click, so it is very easy to install and remove programs in Ubuntu 10.10. Plus, using the Ubuntu Software Center is safe since the technical programs are hidden by default, and the programs listed in the Ubuntu Software Center are safe compared to randomly installing programs found on the Internet from untrusted sites. In Summary, using Ubuntu 10.10 Maverick Meerkat has been a great experience since it is fast, simple, and reliable to use as an everyday operating system for my web browsing, Linux gaming,watching video files on my computer or YouTube, listening to music and online radio, and office/school related tasks like e-mail, word processing, making slide presentations, and spreadsheets.